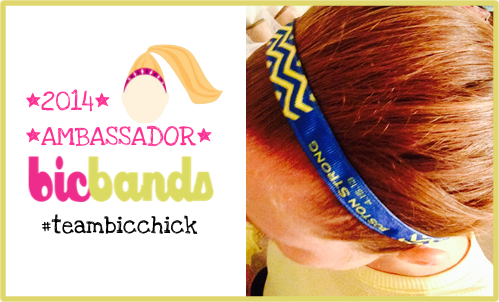 I am thrilled to have been chosen as an ambassador for BIC Bands for 2014! I’ve been wearing these headbands since I spotted them at a marathon expo years ago. Though there are a number of companies that make non-slip headbands now, Bic Bands has such a wide variety of sizes, colors, and patterns, and they never move from your head. Even more importantly, Bic Bands is dedicated to giving back – each month, they donate from the sale of every band to a different charity. So cool, right? I’m honored to have been included in such an amazing group of ladies – check out the rest of #teambicchick. We are super excited to be giving away $20 gift certificates to spend on BIC Bands! It’s easy to enter – just reply to this post with your favorite BIC Band (worth 1 entry), or share your workouts on Twitter or Instagram tagged with #bicchick and @bicbands (worth 2 entries, 1 per day). 13 lucky ladies will win $20 store credit. Contest open 5/22/14 through 6/1/14. Winners will be announced on 6/4/14! Email info@bicbands.com with any questions. And if you just can’t wait to get your hands on some of these awesome headbands, head on over to BicBands.com now and enter the coupon code KaitlinBIC at checkout for 10% off your order! I like the thick gray, it would be perfect for the gym! I like the high voltage electric Yellow. Thanks for entering the giveaway! The contest is now closed. Winners will be announced today!